If you’re looking for a more economical way to build a new patio on your property then concrete is an excellent choice. It’s a durable, long-lasting, easy-to-maintain, solution for enhancing any outdoor living space. Concrete patios can be plain old concrete or we can add a little color or even textures such as slate, brick, or natural stone for a beautiful new decorative patio. Why Do You Need A New Concrete Patio? 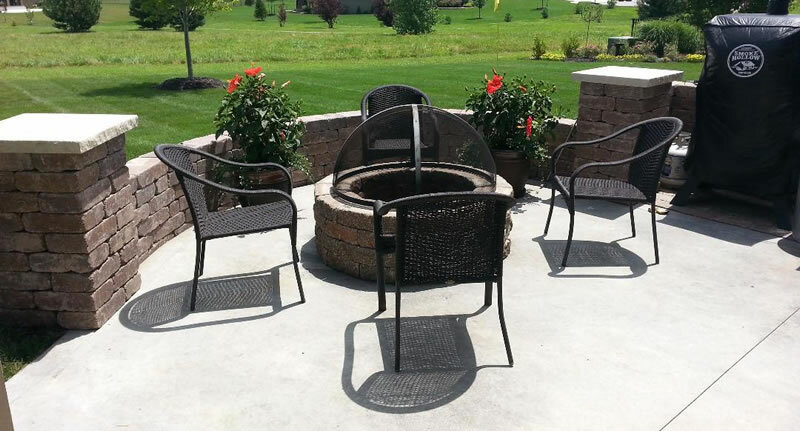 Do you have an existing patio that needs rebuilding? Would you like to extend an existing concrete patio? Would you like to have a concrete slab framed and poured? Do you want to have some concrete walkways or pathways built? Green Acres Lawn & Landscape is a licensed and insured Kansas City landscaping contractor that specializes in hardscaping services including the design and construction of concrete patios, walkways, sidewalks, and concrete slabs. Whether you need to have a cracked or uneven concrete patio rebuilt or you’d like a nice looking decorative or stamped concrete patio we’ll be able to build it for you. It’s not uncommon for a client to contact us and want to replace their existing concrete slab patio. Over the years, and especially if it wasn’t poured right to begin with a concrete patio could develop cracks or dips which just become worse as the ground below the concrete continues to settle and move. This is why compacting the site of the concrete patio or deck properly and with the correct layers of fill is critical to the longevity of your concrete slab. Green Acres Lawn & Landscape can come in and inspect your old concrete slab patio, listen to your ideas an take some detailed measurements. We’ll then be able to provide you with an accurate quote for our services that will include the removal of your old concrete patio and the pouring of a beautiful new and level slab. Let’s talk about your concrete patio or walkway project! Give us a call (913) 422-5111 or fill out or online estimate request form and we’ll arrange a good time for a consultation to discuss your project.